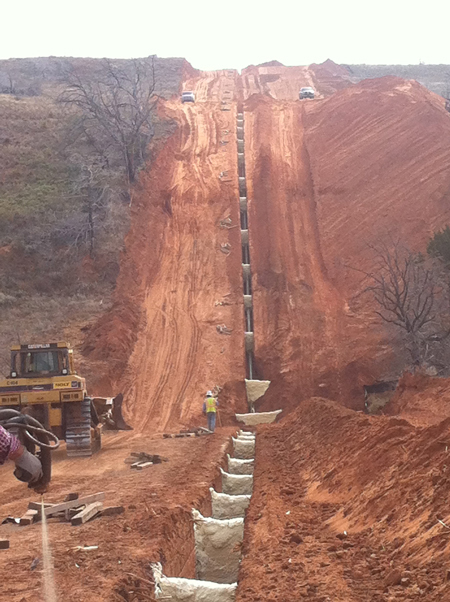 See why PolyLevel® Trench Breaker is a smart solution for your next pipeline project. Are you looking for a faster, safer, less labor intensive way to install pipeline trench breakers? 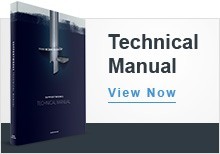 If so, you should consider using PolyLevel® Trench Breaker for your next project. The spray polyurethane foam adheres to the trench to create a strong barrier and control soil erosion. PolyLevel® Trench Breaker can typically be installed by a two-person crew, which significantly reduces labor costs. Because the trench breakers will be sprayed in place, there’s no need for installers to get inside the ditch. 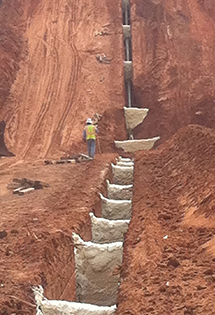 Spray foam trench breaker installation requires experienced technicians and special equipment. Supportworks is the industry’s leading experts for commercial foundation products. 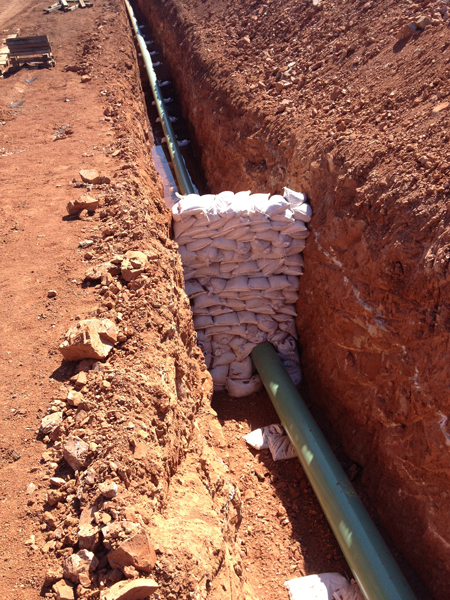 Safety – PolyLevel® foam can be installed from grade level, therefore eliminating the need to work inside the trench. Efficiency – With PolyLevel® foam, multiple trench breakers can be installed in the time it takes to install just one trench breaker when using other methods. Performance –PolyLevel® Trench Breaker fill voids around the pipe, creating a strong support system and preventing erosion of the soil. Cost Effective – A trench can be backfilled within 15 minutes after installing PolyLevel® Trench Breaker and eliminates the need to fill, transport and install sandbags – which means less time, less labor, and significant cost savings! 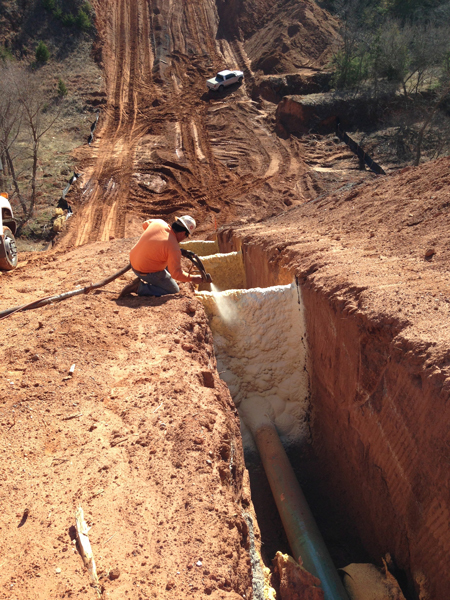 Durability – PolyLevel® foam can be installed quickly without causing damage to the pipe. PolyLevel® Trench Breaker create a water-tight seal and will not shift or collapse under pressure. 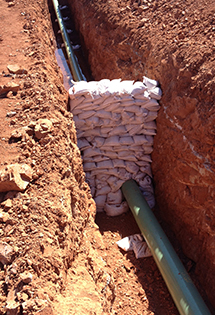 PolyLevel® Trench Breaker can be installed in a fraction of the time it takes to install sandbags and will not damage the pipe. When using spray foam for trench breakers, installers can safely work from ground level, with no need to get in the trench. 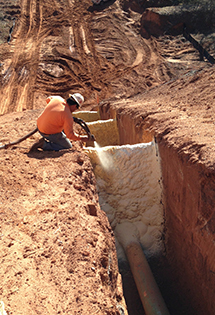 Spray foam trench breakers can be installed in minutes and can conform to any shape that the application requires.